Secluded bush camping along the iconic Darling River in outback NSW. Staying at Trilby Station is a unique and truly authentic outback experience. Fringing the Darling River around 125km south-east of Bourke, Trilby is 320,000 acres of sheep and goat farm. It’s a colourful kaleidoscope of outback landscapes, from the bird-filled river red gums on the banks of the Darling and the treeless black soil flood plains to the ironstone ridges, red loam soils and mulga scrublands. When we visited in spring the property was awash in wildflowers; little gems of white, pink, purple and yellow popping gleefully against the deep red outback soil. And don’t even get me started on the star-filled night skies, where the Milky Way is so dazzling it almost casts shadows. For most of us, 320,000 acres is an unfathomably large backyard, but for six generations of the Murray family it has been their livelihood, their passion and their home. While the family has been on Trilby Station since 1860, current owners Liz and Gary Murray have called it home since 1981, raising their four children on the land while working the extensive sheep and goat property. 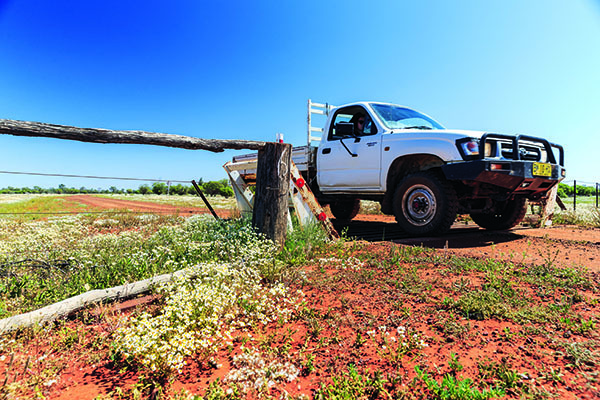 Like many rural station holders, the Murrays have realised their remote outback lifestyle is of great interest to visitors from far away cities and towns, and as such have opened the gate to tourists. 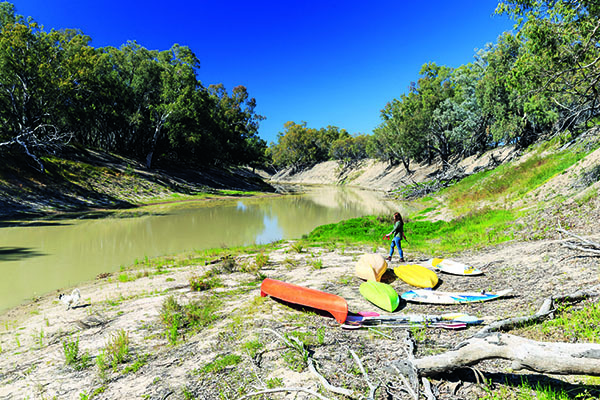 There’s self-sufficient bush camping on the banks of the Darling River plus powered sites on higher ground. Both are suitable for camper trailers, with the riverside sites idyllically nestled in amongst the red gums with fire pits at each site. 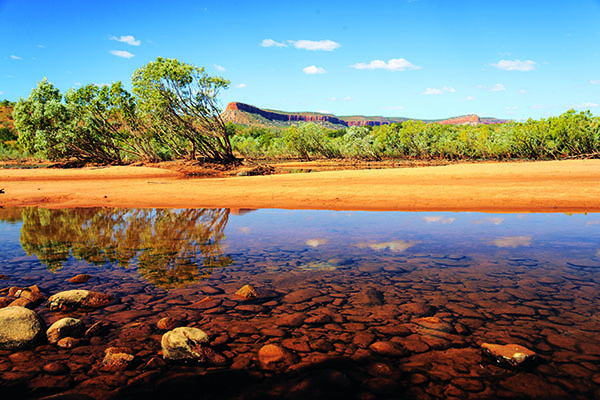 If secluded camping on the iconic Darling is what you’re after, you won’t find a much better option than this. The powered sites are around 100m back from the river, close to the camp kitchen, bathroom facilities, gas barbecue and paved fire pit, and all camping guests are welcome to use the swimming pool and complete the Mud Maps tour. 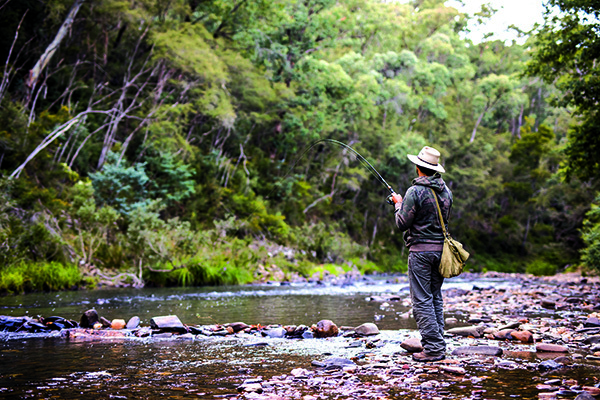 Fishing is a popular pastime at Trilby, so cast a line in the Darling and see if you can land a yellowbelly or a cod to cook up on the coals of your campfire. At the very least, you’re bound to catch a carp – a guaranteed fun time for the kiddies. Yabby nets are also available to borrow, and while they are found in the river there’s a well-stocked pond near the camping area plus several stocked dams along the Mud Maps drive. Shooting yabbies in a barrel, perhaps, but you won’t care when you’re peeling the shells off fresh, sweet meat over a glass of wine or a beer at the campfire. There is a ready stock of canoes and kayaks available to borrow from the sandy beach near the woolshed, so have a paddle and enjoy the peaceful sounds of galahs and other birds hanging around the trees beside the river. They know it’s the place to be in this hot, dry landscape, and so do you! The Murrays have prepared an excellent self-guided ‘Mud Maps’ 4WD tour of their property, complete with numbered gate posts and informative trip notes detailing everything from flora and fauna, styles of fencing used and why and the types of farming that happen in specific paddocks. The trip encompasses a range of changing landscapes and offers fascinating insights into the farming practices used and challenges faced on Trilby Station. You’ll learn what the Murrays do in a flood, how they irrigate this semi-arid land, what plants are edible for stock and how they feed stock in a drought. But for me, the most interesting part of the Mud Maps tour was calling into the perfectly preserved 1950s homestead. This disused home is still full of simple early 1900s furniture, the beds are made in chenille quilts, the dining table is set and the pantry is stocked with ‘50s-era groceries and medicines. The Murrays are extremely generous in allowing guests free reign to explore this very special part of their family history, and it goes without saying all guests are respectful of the property and do not remove anything from it. Liz explained how, on large properties like Trilby, there would generally be more than one homestead on the property. When a family was ready to progress to a better homestead, they would leave the house set up for the next inhabitant, usually a younger family member. They would stock the cupboards with supplies so the house could serve as accommodation for workers and passers by; a lifeline in this remote, rugged and often hostile environment. These days it's just birds, snakes and ghosts that call this one home. 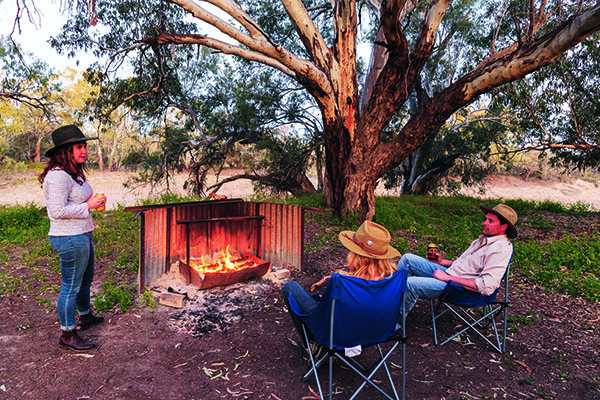 If you have a yearning for a true blue outback experience on a working property – or just a spot of peaceful riverside camping in the outback – Trilby Station is well worth a visit. Picture a stone worker's cottage in a valley surrounded by some of Australia's tallest mountains, in a clearing with plenty of room to move around. Add a river stream – cold, but with the promise of rainbow or brown trout for anglers with a keen eye. 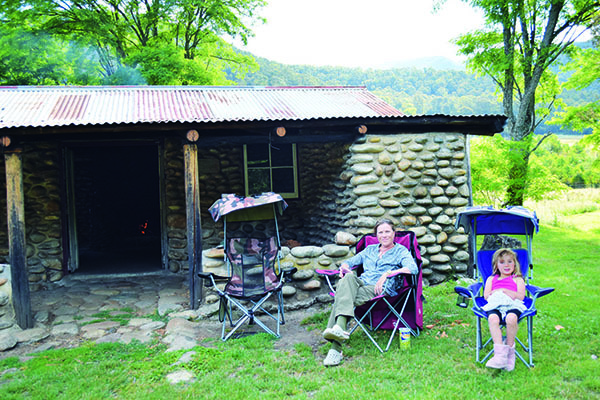 Then picture yourself camped nearby, using the hut as a sitting room when the sun goes down and the air gets chilly. Welcome to the old Keeble Campground. Keeble Hut is part of the Kosciuszko network of historic huts built in 1942. Situated on the Swampy Plains River near the Alpine Way, you'll feel like you're straight out of a scene from the Man from Snowy River. The secret is that most people stop at the public campground next to the bitumen at Geehi Hut. With a 4WD and an offroad camper, ford the river and head along the Behrs Flat trail. You'll find this magical place just a couple of kilometres away. Bring your own firewood for the fire pits and barbecues. And enjoy the drop toilet. It wouldn’t be a riverside campsites feature without some solid representation from the beautiful Victorian High Country where icy cold streams and rivers surge inexorably towards lower ground. And some of the High Country’s nicest campsites can be found near Jamieson, which, incidentally, is also one of its prettiest towns. Following the Mansfield-Woods Point Road out of town there are numerous campsites perched atop the Goulburn River that snakes alongside the road, but we opted for Skipworth Reserve, a sprawling site tucked into a bend in the river. Here we found no shortage of lush green grass upon which to set-up camp and so we chose a spot beside a fire pit and settled in for the night. A set of drop toilets provided a small luxury, but other than that this joint is for the self-sufficient. In the morning, as the High Country fog lingered like a blanket over the surrounding mountains, it was time to flick a few lures across the surface of the rocky river to see if we could trick a few trout. Turns out they were too smart for us, but perhaps a wilier fisho would’ve had more luck. 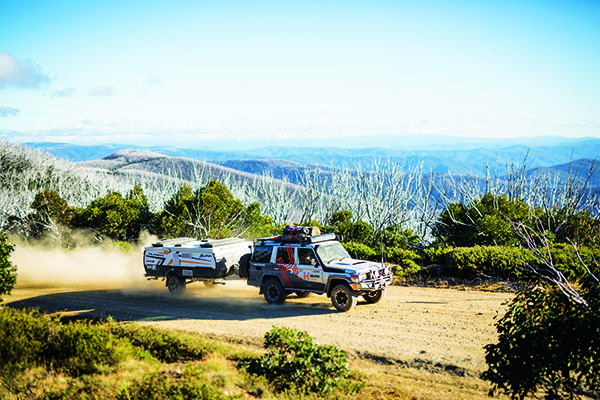 When it comes to offroading, Jamieson sits pretty amongst some seriously beautiful tracks offering classic High Country landscapes. Not least of which is the Jamieson-Licola Road, a quality gravel road that climbs deep into snowgum territory and offers vertigo-inspiring views across the mountains. Long before the term glamping ever passed the lips of ad executives in Sydney, outback campers were happily shelling out for a beer at the bar and ordering meals before kicking back in the magical hot springs. It seems that Lorella Springs, a working cattle station, had somehow managed to combine unmitigated luxury with full throttle adventure. 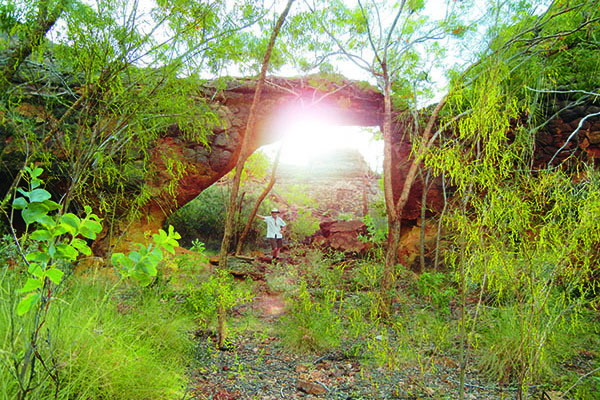 Set on a million-acre property, access is 175km from Borroloola and about 145km from Cape Crawford, taking in the many faces of the Gulf. The campgrounds are enormous and well cared for, and range from full facilities including hot showers to totally self-sufficient bush camping. And the 4WDing is A-grade, too. The property offers billabongs, canyons, ancient rock formations, swamps, streams, rivers and, for the nature lover, the nudie camp and hot springs. Here, you can find yourself adrift for hours in the cool crystal waters of large pristine pools and spectacular gorges, with monoliths providing excellent vantage points to launch a canoe. And the best bit? Networks of rivers are ideal for those carrying a rooftop tinny. 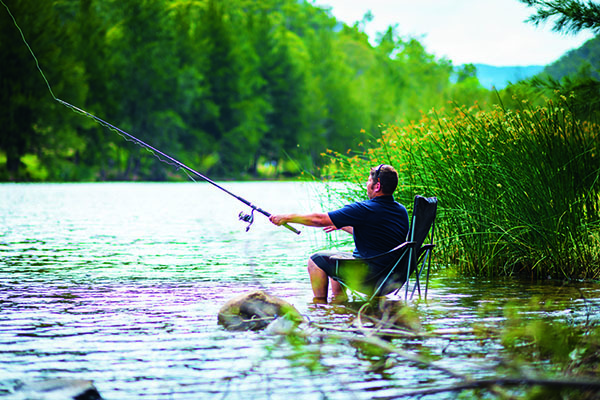 If you’re keen to cast a line, the Rosie Creek fishing camp is a challenging 85km north of the Lorella Springs homestead and main campgrounds. And if you’re willing to brave it you can actually launch a boat from here and make your way to the sea. When CTA last visited Lorella, the enterprising owner Rhett timed our visit to Rosie Creek with swelling tidal waters, guaranteeing a chase up the shallow rocky beach and sand bars for our fish-fanatical crew. Hailed as being the wettest town in Australia, Tully might not seem like the immediately obvious choice for a primo camping destination. But hear me out. All that rain results in some seriously lush tropical rainforest in the mountainous hinterland that gradually crumbles to extensive coastal flats carpeted in sugar cane stretching out to meet the Coral Sea. The mighty Tully River surges through the rainforest creating fearsome waves over giant boulders before flattening out to calm, deep pools perfect for swimming. This is white water rafting country, and you’d be mad not to give this adrenalin-pumping activity a go – just be sure to pack a spare pair of duds, you might need ‘em. Or, while away your time peacefully camped beside the river listening to the ebbs and flows of the rainforest. You might even spot a cassowary – or a freshwater croc! When it comes to epic riverside camping it’s hard to imagine how you can beat camping on the banks of the mighty Pentecost River in the Kimberley, watching the majestic Cockburn Ranges glow golden in the last of the day’s light in the background. Located on the Gibb River Road right near the famous Pentecost River Crossing, Home Valley Station is a working property that has well and truly embraced visitors, offering a range of camping, accommodation and facilities including a laundry, swimming pool and even a bar and grill. But we reckon the pick of the station is at the bush camping area down on the river. Everything you love about the Kimberley, all in one place. You’ll find Wollondilly River Station in the beautiful Southern Highlands of New South Wales. It lies around 50km west of Bowral and Mittagong on Wombeyan Caves Road, right on the Goodmans Ford on the Wollondilly River. It’s only three hours from Sydney or two-and-a-half hours from Canberra, making it the ideal weekend getaway. 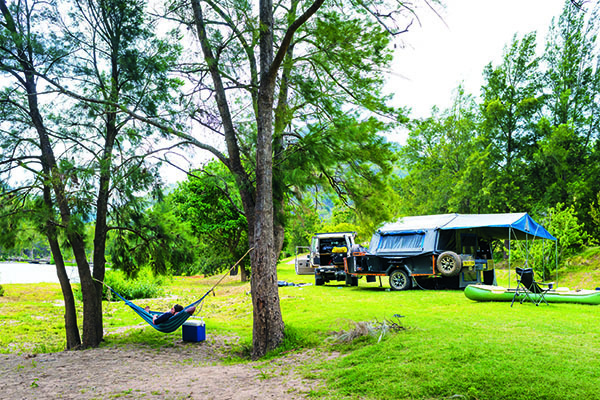 There’s not a camper alive who doesn’t like a relaxing campsite right next to the river, so the hardest part about nabbing yourself a prime piece of real estate here at Wollondilly Station is choosing from all the prime spots. If you can’t tell by the photos, we got an absolute cracker! If lazing around at camp for a few days isn’t your style, I’m sure a leisurely paddle downstream will do the trick. Nothing much compares to canoeing in these parts, just ask the dog; she likes it more than I do, I think! There’s a maze of walking tracks around, and even a few spots to explore with the 4WD. Mountain bike riding is popular on the property, and if you own a horse they’re welcome to come along for the ride – it doesn’t get any more pet-friendly than that. The river is full of fish, including trout, native Macquarie perch, bass and fresh water catfish. But here’s something you don’t hear every day; property owner Brian reckons you’ll have a ball catching and eating carp! Yep that’s right. He reckons the carp put up a great fight and, because they are being caught from a fresh water running stream instead of a muddy dam, they actually taste half decent. Use worms or even corn as bait and you might just be surprised. 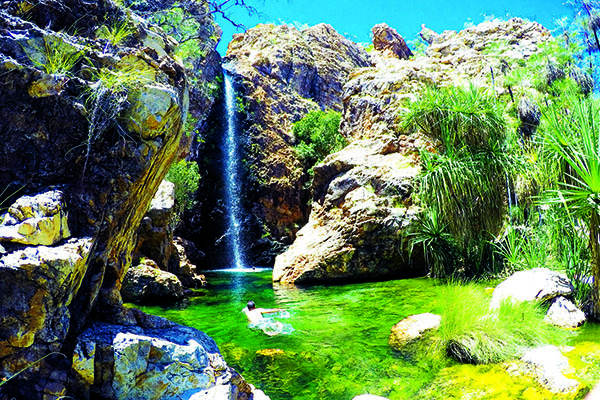 Kicking back in the crystal waters with the power of small private falls emanating behind, after days tackling the old tele: surely you could not get much more Cape York iconic than this? 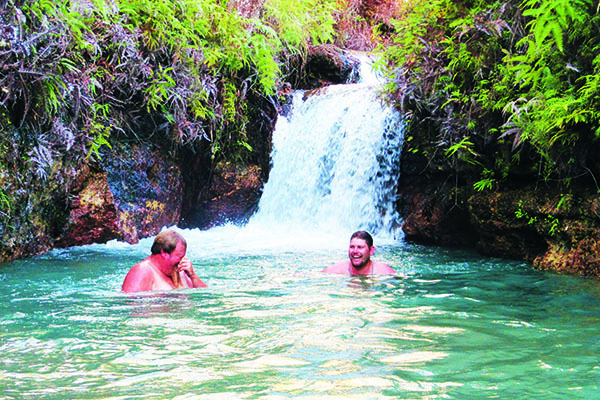 Her soothing waters and proximity to Eliott and Twin falls, make this crossing and camp an ideal base for Cape York revellers to regroup after days of technical driving in humid conditions. Many travellers simply overnight here or at Canal Creek in their haste to reach the tip but this region is well worth lingering at a little longer. You’ll find this awesome swimming hole hidden a few metres downstream of the main vehicle crossing on the track. The Overland Corner Pub has long quenched the traveller’s thirst, but did you know that it also offered respite on the banks of the Murray River? Like the paint strokes in a McCubbins or Streeton you can imagine the weary drover carefully tending his herd under towering red gums with the limestone cliffs basking in an early evening glow. The Overland Corner Hotel and her fossilised limestone walls is the oldest building in the region; it put the town back on the map when it was lovingly restored in the 60s, thanks to the enterprising locals who advocated for the effort and help raise extra funds. You can still enjoy a meal at the Overland Corner Pub, but you will need to book ahead. 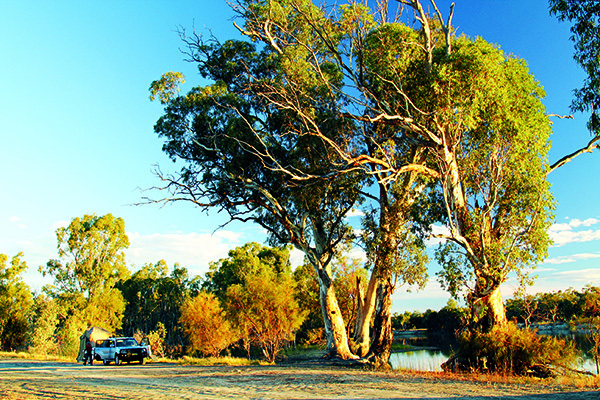 You’ll pass through the Mann River Nature Reserve, which has some terrific riverside camping including at the the Mann River camping area. The camping areas are ample and feature picnic tables, fireplaces, firewood and pit toilets. 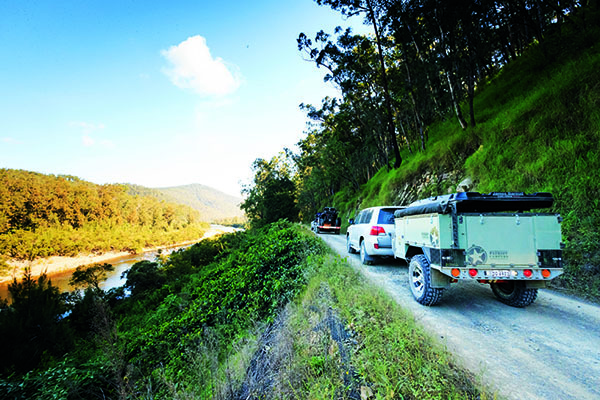 Just down the road from the Mann River camping area is Tommys Lookout Fire Trail, a well-maintained 4WD track that climbs to more than 1000m in just 4km. With switchbacks and erosion mounds it’s a fun challenge, and near the peak of the climb you’ll be required to cross several crests of dry waterfalls, so it’s a good idea to give this route a wide berth if it’s wet. Being so high, the views over the river gorge below and to the plateaus in the distance are amazing. Highlights along the main track include the ghost town of Dalmorton and a convict-carved tunnel stretching 20m through the cliff. Check out the full feature in issue #114 of Camper Trailer Australia magazine. Subscribe today for all the latest camper trailer news, reviews and travel inspiration.